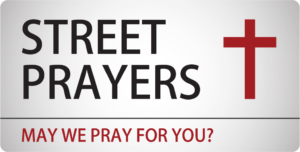 The Street Prayers are volunteers from churches through Bromsgrove. On the fourth Saturday of the month they have a stall at the market on the High Street from 9.30am – 2.30pm and they offer prayers for anyone who is in need. You can also light a candle for someone you would like prayer for. For more details, or if you would like to be involved in this project, please use the contact form below.